Ok, I love this page! 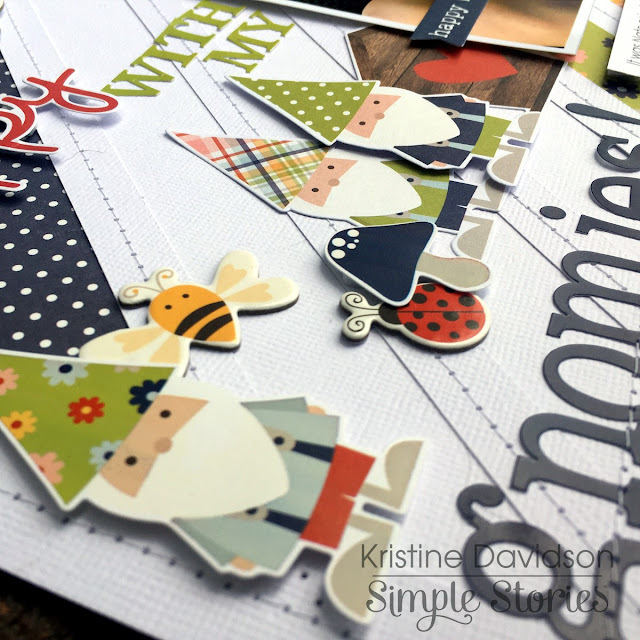 Those little gnomes from the Simple Stories Bloom and Grown collection are super cute.. I wanted to use them with a cute picture of my nephew and I think this little face was perfect for those " Gnomies!" 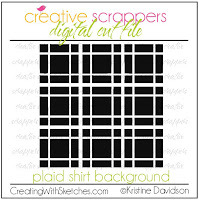 To start this page I used a diecut background that I created using my Silhouette Cameo. 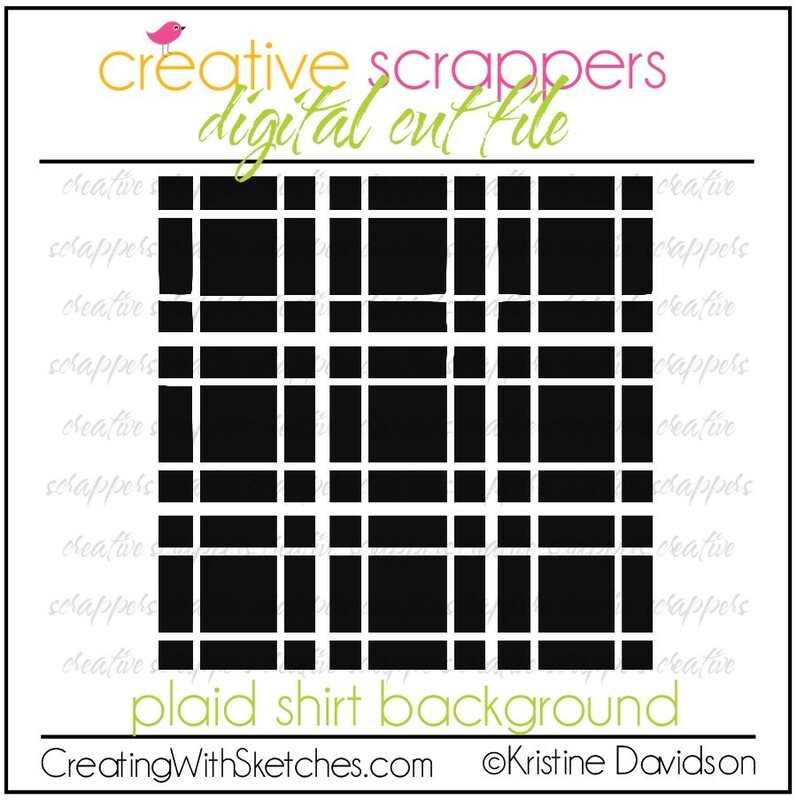 It's a simple background and so perfect to use some left over pieces of paper. 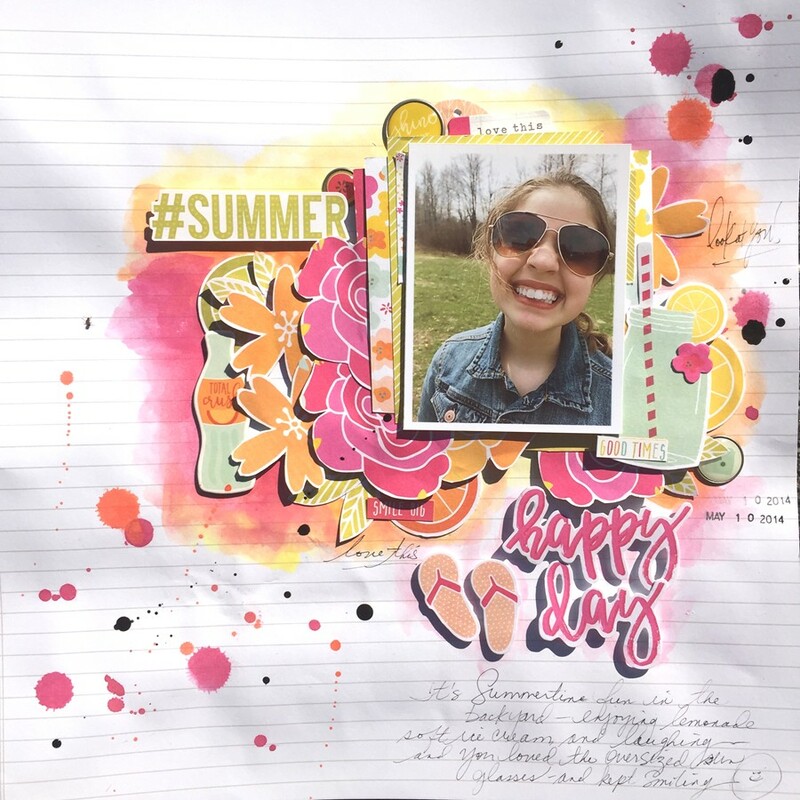 I used a variety of colors and also a mixture of papers for this layout. The little gnomes were perfect for that smiley face of his. I just felt like it added Fun to my page. A closer look at the dimensions of my stickers and diecuts. You can also see I did some sewing on the cardstock alpha stickers, and the diecut background. 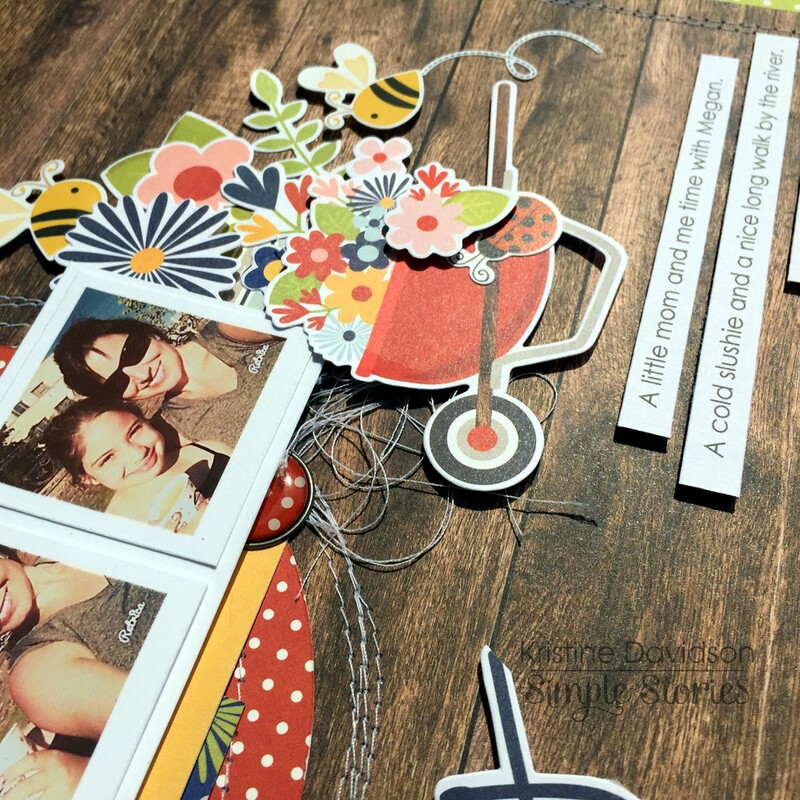 Adding chipboard pieces to a page can sometimes be challenging especially if you love layers or aren't sure how to position those larger pieces. Stack them! 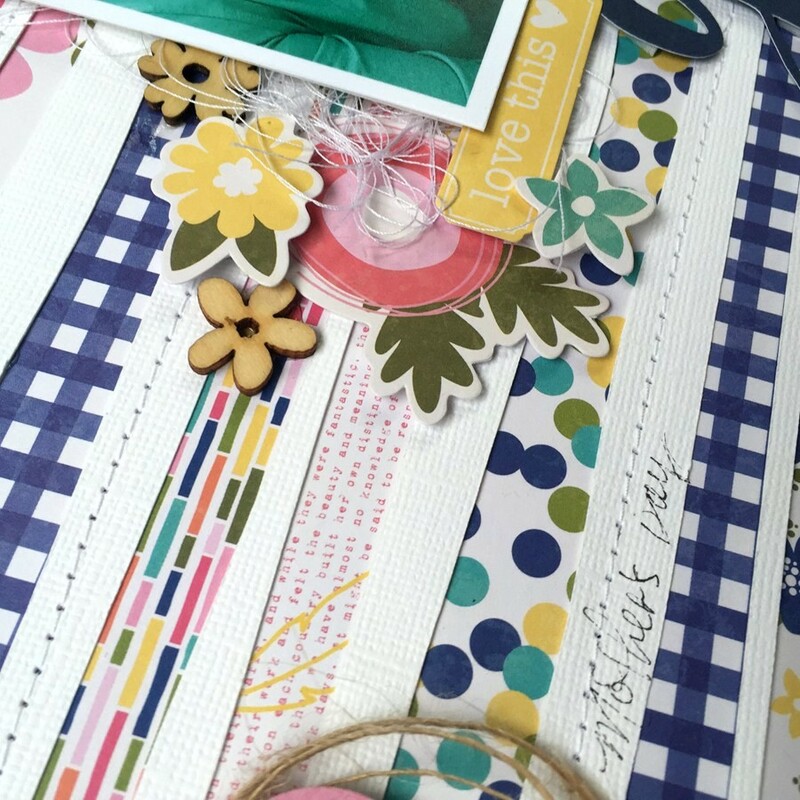 Add some popdots to one side of your chipboard piece and then the other side position it on top of your first chipboard piece. 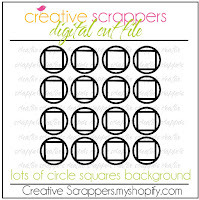 This creates dimension and looks great on a layout. Thank you so much for reading and being a fan of Simple Stories! Sometimes creating a card can be challenging - but sometimes it just comes together. 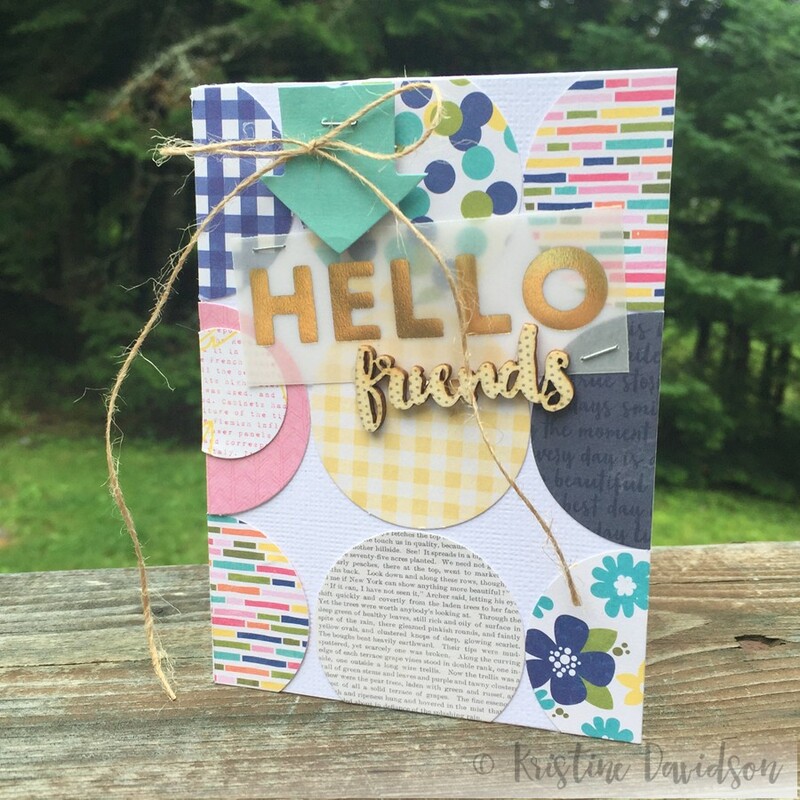 Using a 2" circle punch and some left over pieces of paper made this card super cute and easy to do! I used some Jillibean Soup - Healthy Hello Collection, wood veneer and a vellum gold embossed tag. I created this layout for Simple Stories using the Bloom & Grow Collection. Love the colors in this kit and that wood grain paper -- fabulous! 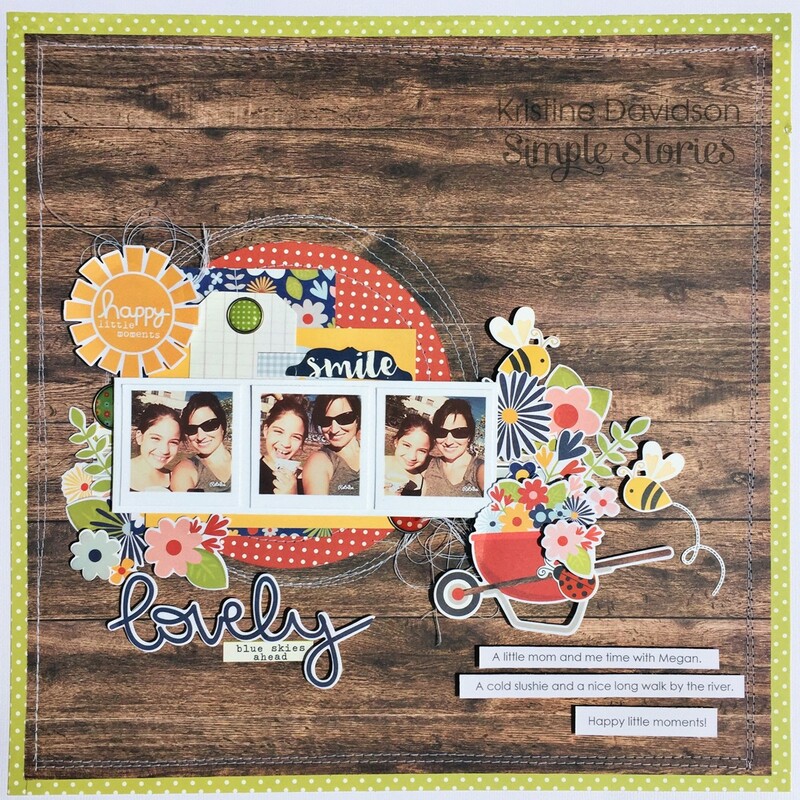 I started with the wood grain background paper called "dig it" This as my base makes it easy to add assorted colors from this collection while not making my page too busy. 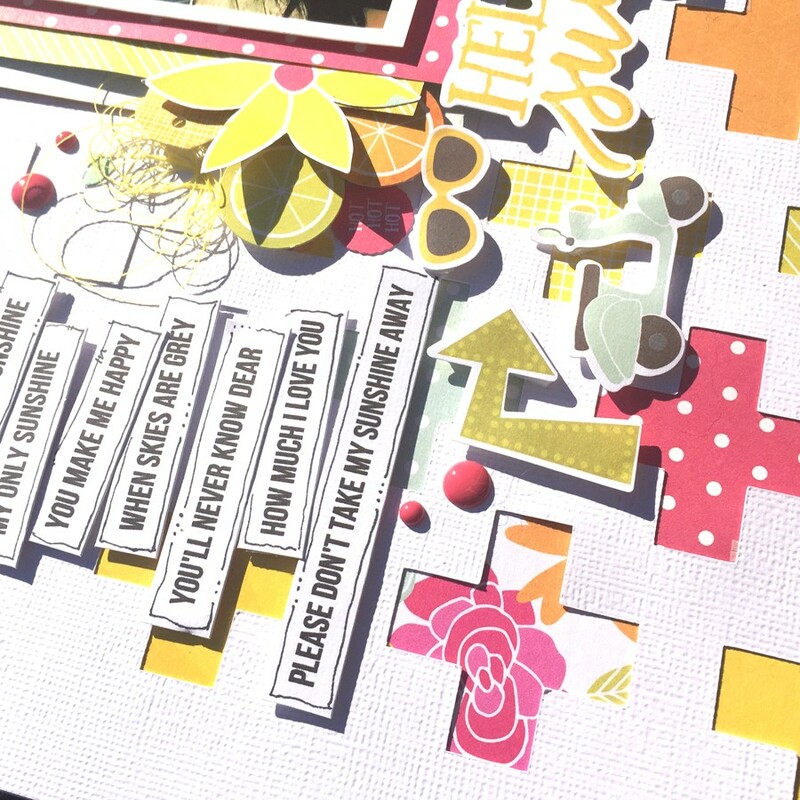 I added tons of flower diecuts and subtitle using the word lovely with a word sticker. 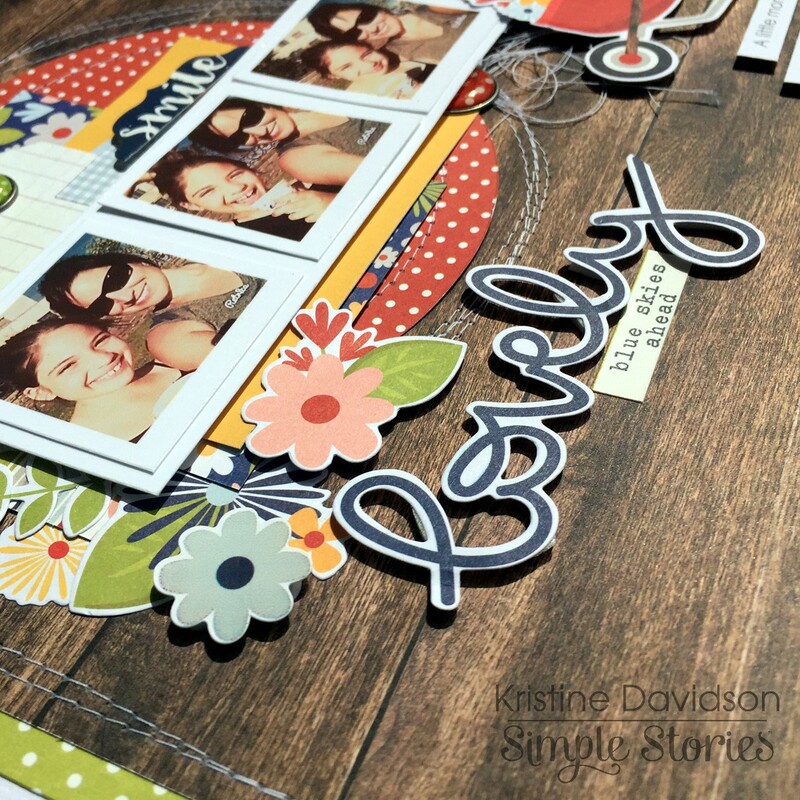 Adding some sewing to my layouts is something i've done for quite some time and the little thread bunched under my photos was inspired by Missy Whidden. I love the little extra detail it gives to my page. I usually add some form of twine but I avoided that this time and created texture with this thread. Journal Strips are easy to do since I am more comfortable journaling this way compared to journal tags or other. 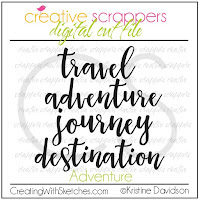 I type my journaling on a word doc and print it on a 4x6 piece of cardstock and then cut up to make strips. 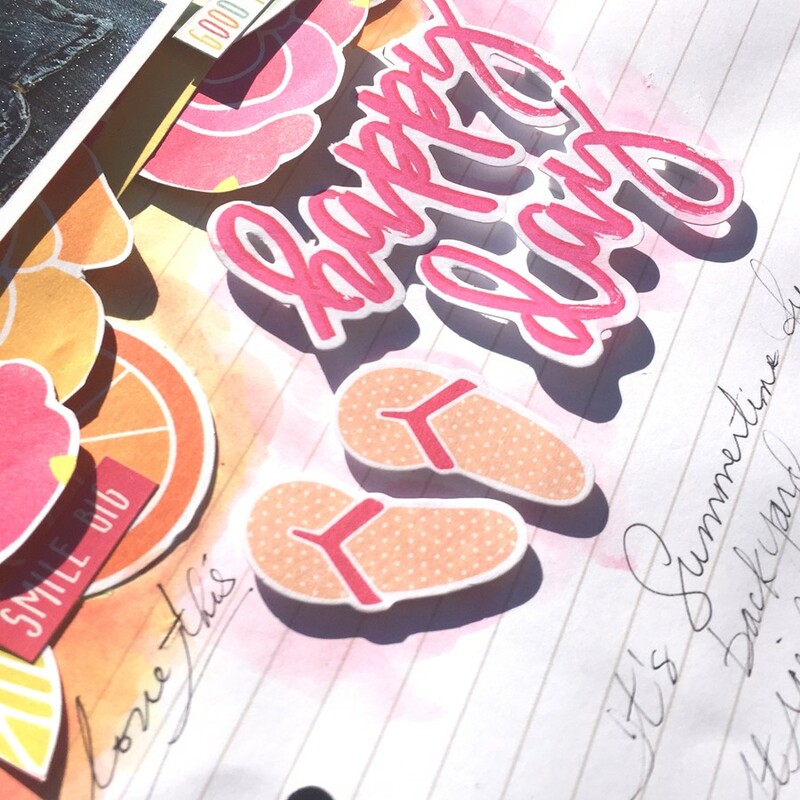 Most of my layouts have this form of journaling. I cannot leave a page unfinished without adding dimensions. Of course I used my dimensional adhesive under the flower diecuts! One must always use popdots! 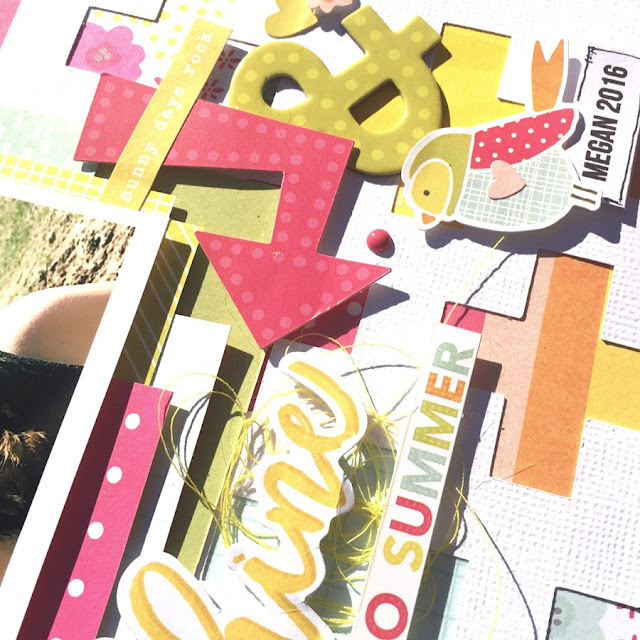 The Jillibean Soup design team recently had the opportunity to create with Nicole Nowosad's cut files from her shop - Just Nick. 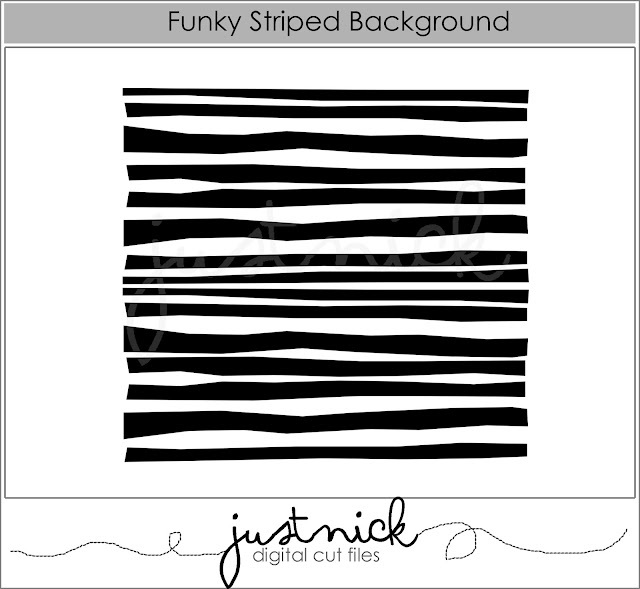 I selected a simple background file called Funky Striped Background. I was able to use some small strips of scrap papers and create this awesome page. I love all the colors and patterns and that cute picture of my sister and her daughter was perfect too. My niece is growing up so fast it makes me sad. I just want her to be little forever! 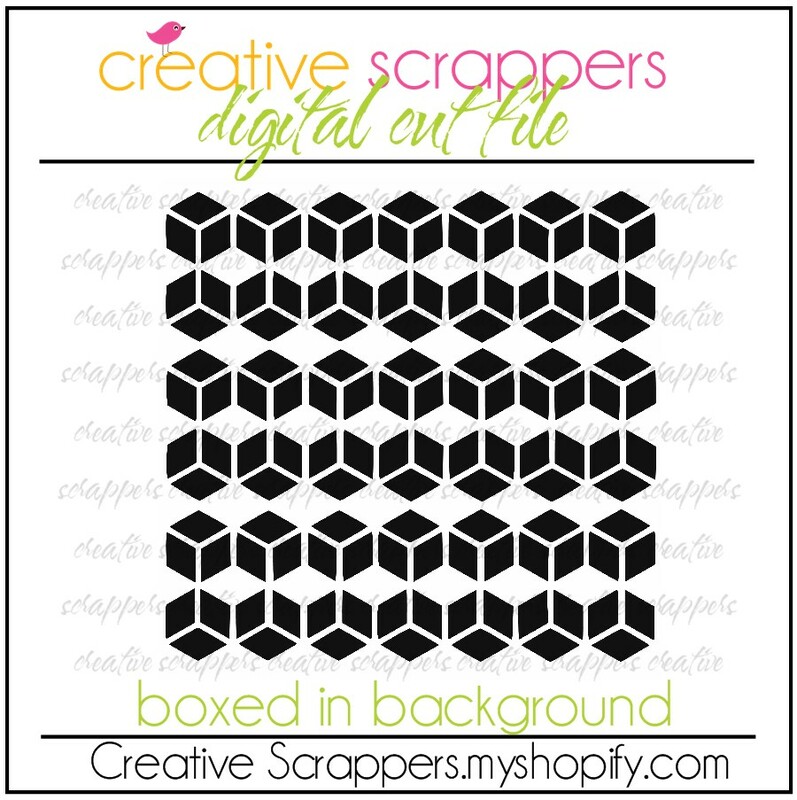 After a few weeks of thinking about creating cut files for your digital diecut machines .. 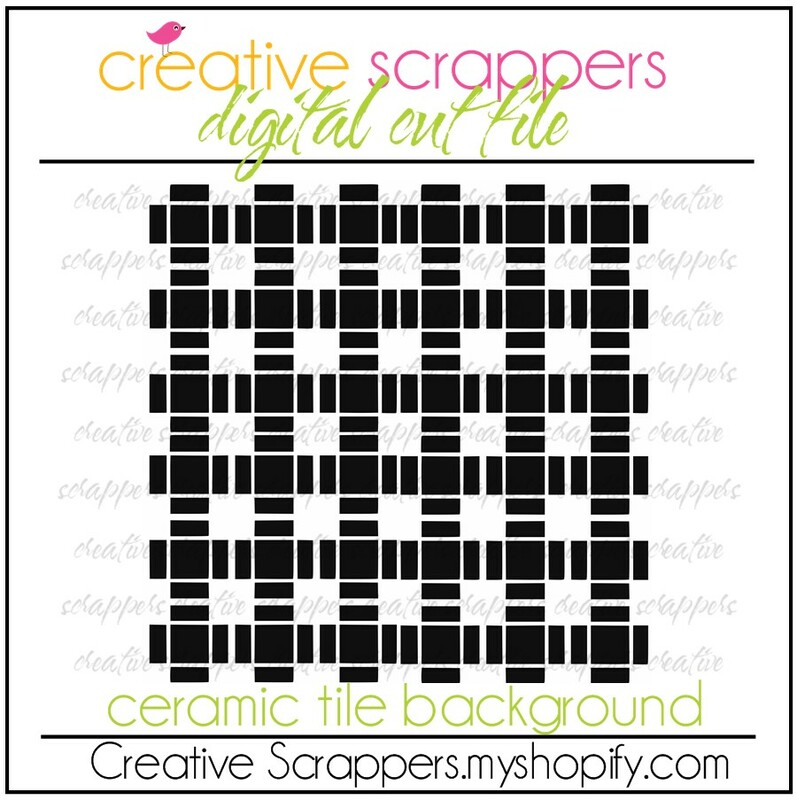 I took the plunge and started creating my own files for sale. 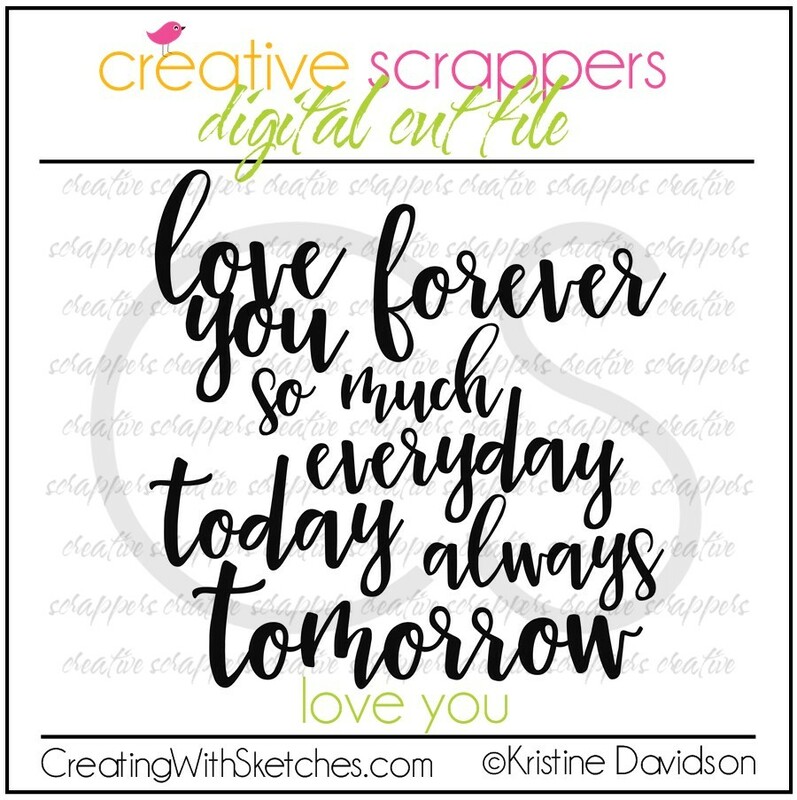 I have a few already posted a few - mostly backgrounds and I am creating words right now to add to the store in the next few days. I am really enjoying the process and it allows me to be creative and do something when I'm not feeling like playing with paper. 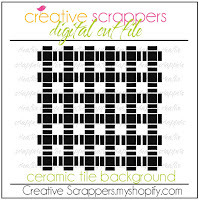 If you enjoy creating with cut files please take a few minutes and visit my store! I do have a promotion right now until August 15th .. It's been announced! 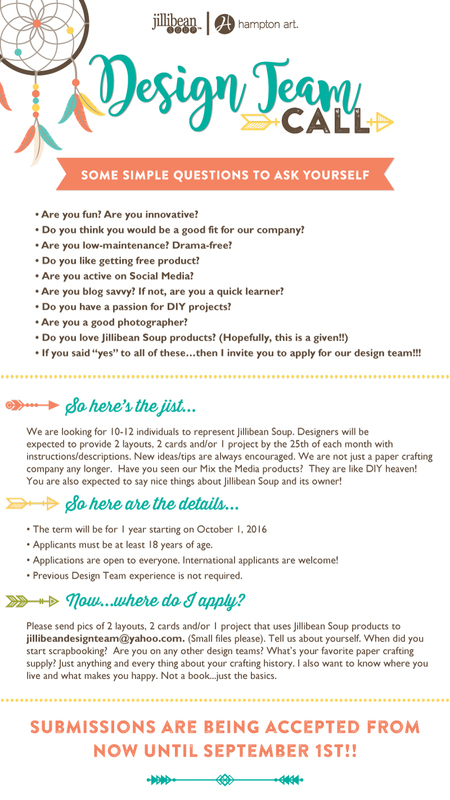 Jillibean Soup is now accepting applications for the latest Design Team call! A wonderful company to work for -- submit today! 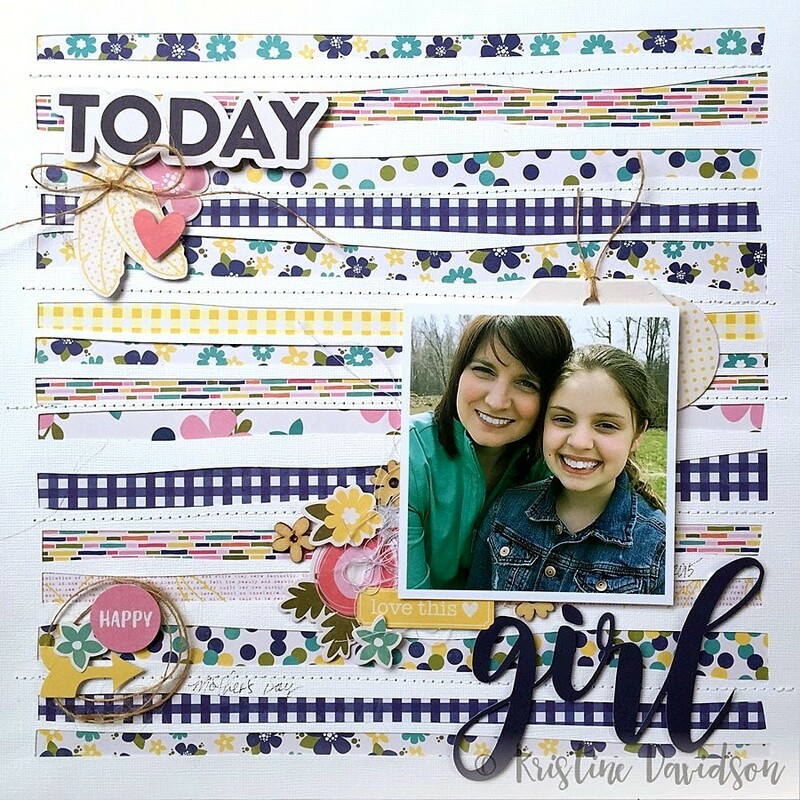 Hello Friends, I will share 2 of my latest layouts with you today and my love of Sunshine & Happiness! This collection is one of my favourites and I have almost exhausted every. single. piece. of paper in this kit. 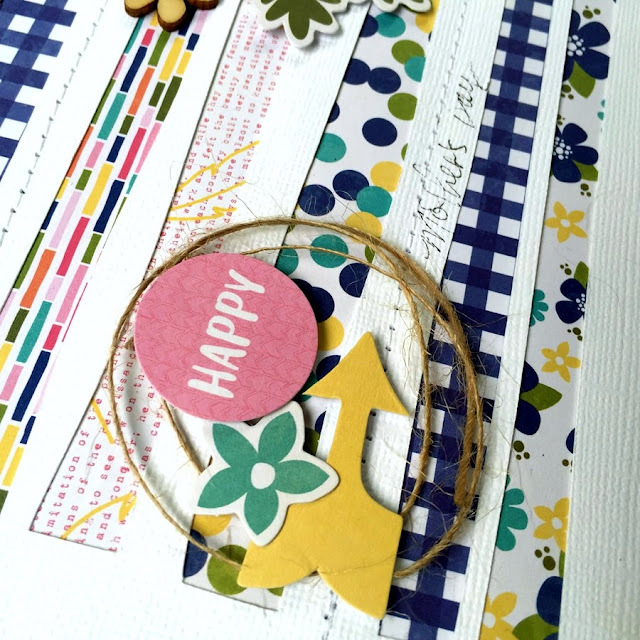 This collection is full of bright sunny papers, pinks, orange, yellow and the bits and pieces make creating so much fun. The first layout is called " Hello Sunshine "
This picture was taken of my niece in the month of May as she was playing outside and enjoying the sunshine. I wanted to add some fun embellishments to this page and included flowers, fruit, sunshine, and my favourite journal strips. 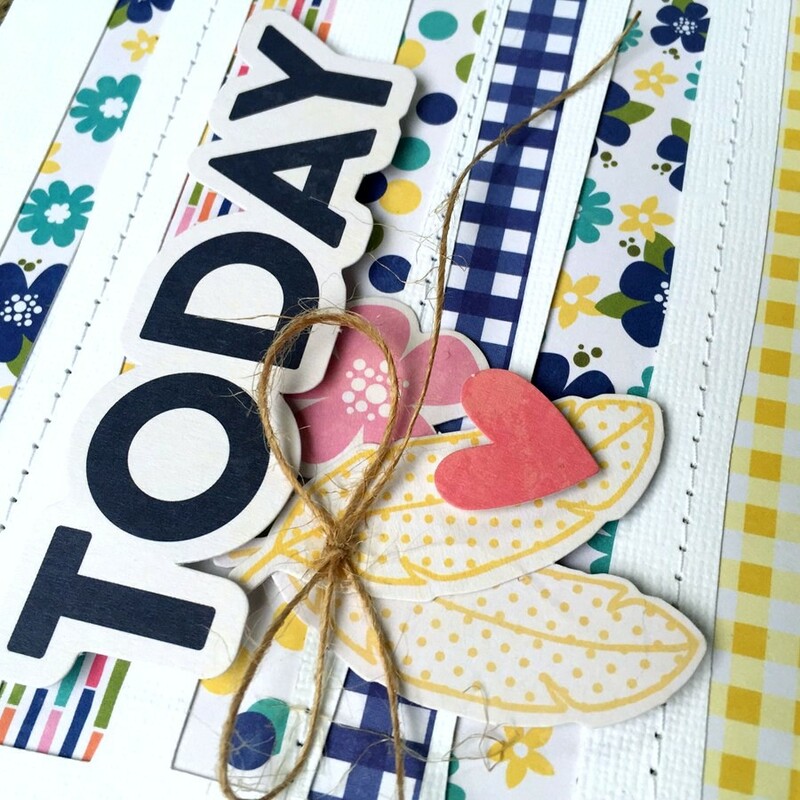 To start my page I created a cut file with my silhouette cameo. 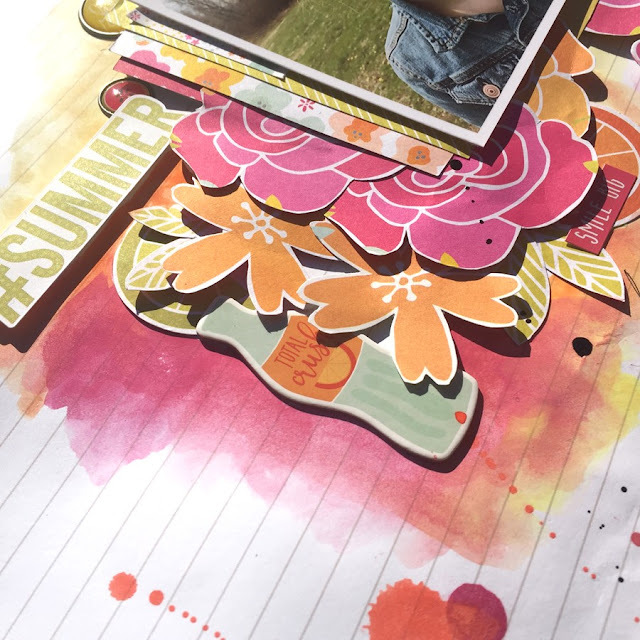 I love pages that allow me to use a cut file because I find I can add more colors and use up some smaller pieces of papers too. I left the top part white and just concentrated on the bottom for an assortment of colors. I added layers of chipboard, bits and pieces and even a bit of thread to add more texture. In this picture you can so many elements but for some reason with layers and overlapping it doesn't feel like too much. It creates a beautiful cluster. 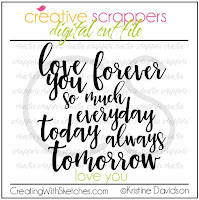 You can also see I used a few 3x4 cards behind my photo to add more layers and added dimensional adhesive to create elevation. I didn't fuss over a title for this layout. I simply used a piece from the Bits & Pieces package and selected Hello Sunshine for my title. Nice and Easy! 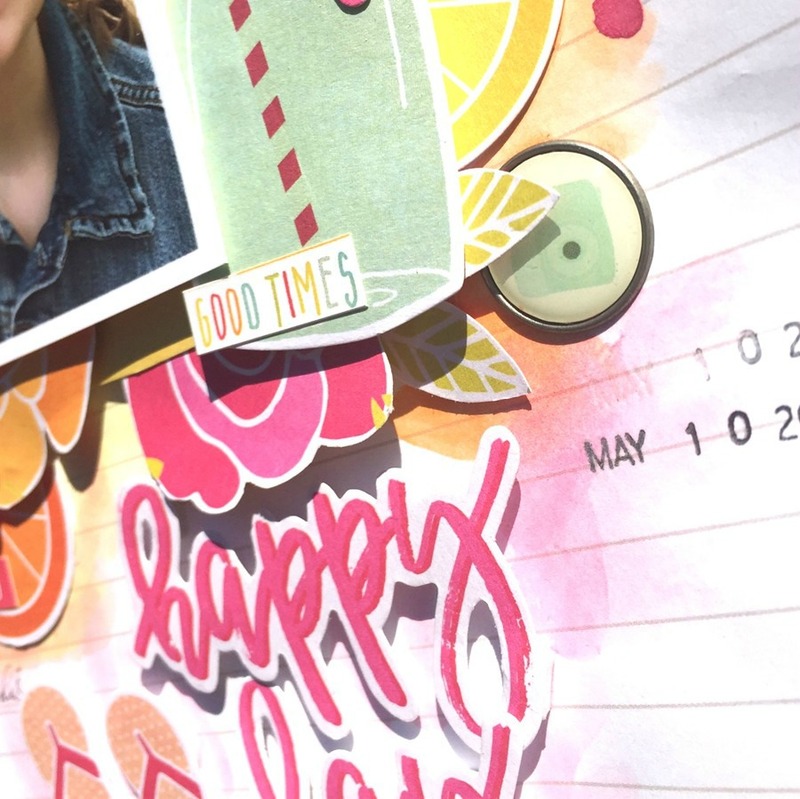 My Second layout for you today is called "Happy Day"
Sometimes we have to step out of our element and try something new and this was one of those times. Yes my background paper is warped, yes I have some paint splatters that aren't perfect but that's okay. This collection allowed me to create something different. It gave me tons of color to work with, some great summer die cuts and really made this layout come together. 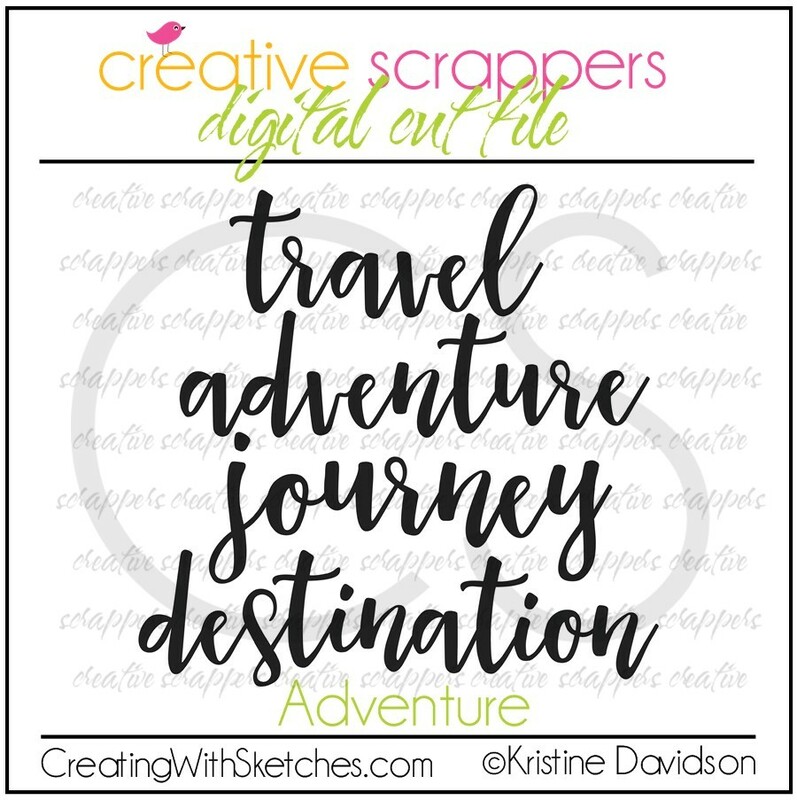 For my title, I created with the same technique - selecting a few Bits & Pieces, adding dimensional adhesive and making it my focal point for my page title. 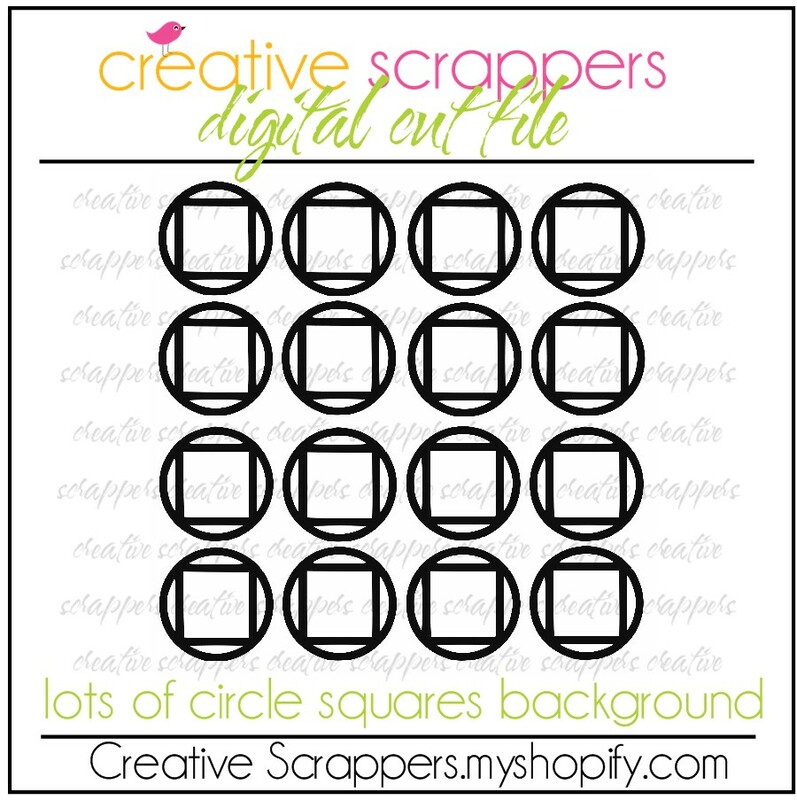 This is such as great way to use supplies and match it with your layout. 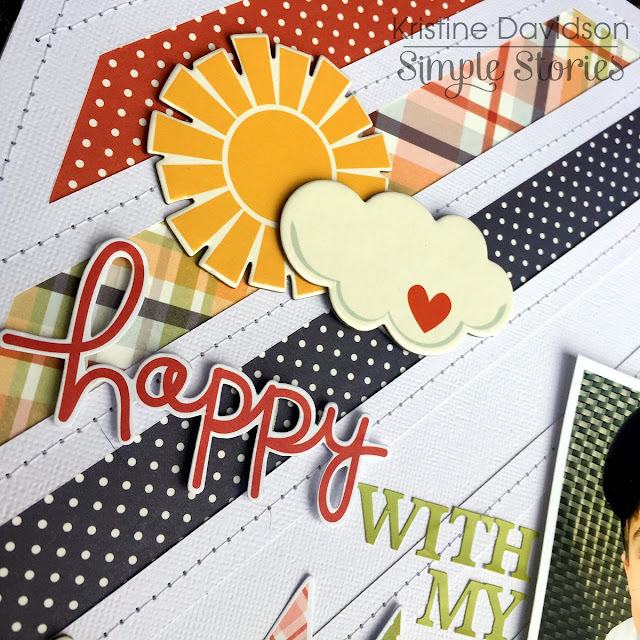 I hope you enjoyed my layouts today and enjoy making your own with this fabulous Sunshine & Happiness collection! If you are interested in seeing more of my work you can find me on instagram with user name @KristineDavidson.